Representing the green & gold! One day, I received an email from my friend P regarding our upcoming trip to New York... would I mind maybe going to a baseball game instead of seeing Mamma Mia? Maybe this Yankees team or something? One of my "bucket list" items is to visit all the MLB ballparks. I am not sure this will ever happen, but I am certainly not going to stop trying. 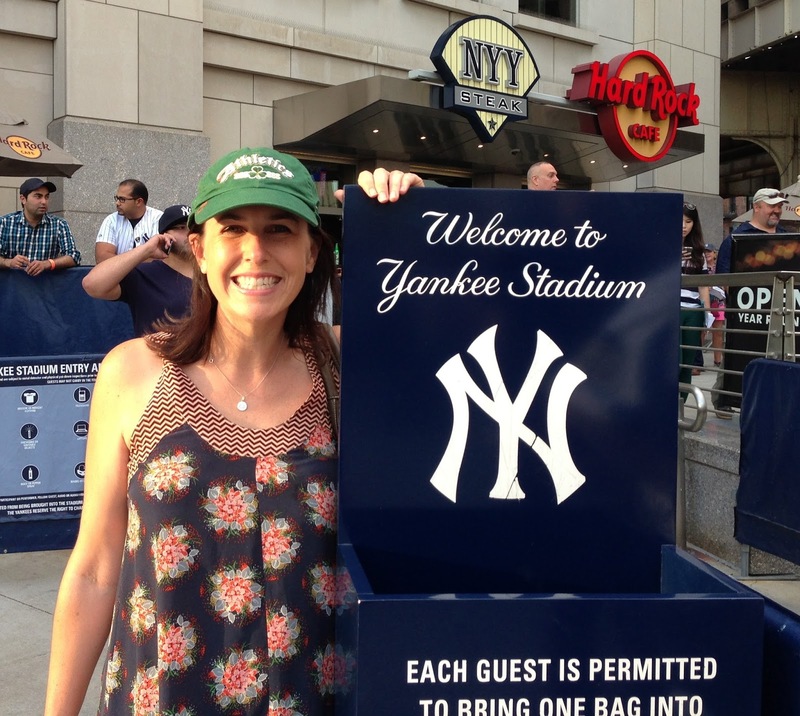 I'd missed previous opportunities to go to the old Yankees Stadium, so I was really excited to go to the new one. We checked out the seating maps and chose what seemed to be great seats (I always find it hard with these newer ball parks... there is often some sort of obstruction risk). When game day arrived, we decided to drive into the City early from New Jersey, park near the stadium and then go sightsee. This ended up working perfectly...there is a lot directly across from the stadium that cost around 30$ and had very easy access in & out. The subway is also conveniently located directly across the street from the entrance, which made the sightseeing/head back combo super easy. Once we got to the stadium, a little asking around confirmed that if it is your first visit to the stadium, you can get a special certificate. The office to do this is located behind center field; they are very friendly and print the certificate while you wait! It's a great free souvenir. The thing that amazed me most was being in a tank top throughout the entire game, with no need for a sweater. This is crazy to me, where, in the middle of summer, we're often found in several layers of clothing!